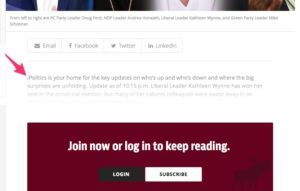 Leaky Paywall is an easy tool to set up. It can be installed easily, you can input your baseline settings easily, and then it can begin increasing your subscriptions easily. Of course, we can make it fancier. We’ve recently discussed some of the ways we have tweaked and customized settings for our customers. But there’s a middle ground between the default settings and suped-up version, too. Leaky Paywall already has a number of fantastic, built-in features (and some easy to implement customizations) that go beyond the simplest functions. We’ve put together a list of our favorites. These features allow you to experiment with different subscription and payment incentives, to integrate with different platforms and media, and improvements to the reader experience. 2. Sell gift subscriptions, especially during the holidays. It’s easy to add a ‘gift’ option to your checkout process. Current readers (or friends and family of future readers) can purchase the gift subscription on behalf of someone else. They can even choose the date the confirmation email will be delivered. Early Christmas shopping? Done. 3. Offer a free gift with the purchase of a subscription. Many publications also create supplements: e-books, white papers, kits and collections. Leaky Paywall easily integrates with your WooCommerce store to give one of these side publications as an incentive to purchase a subscription. You can even offer tiers of gift to match any tiers of subscription, allowing them to choose from among several options. See how it works here. 4. Set an annual expiration reminder. 5. Include a coupon in your renewal reminders. Create an additional incentive for your subscribers to renew promptly with coupons for early (or timely) renewals. The checkout procedure is already equipped to process coupon codes with your chosen discount. You can include the coupon code in your renewals email. 6. Customize your Thank You page. Improve upon a generic “Thanks For Subscribing” splash page with whatever copy, images, or videos you like. We recommend links to “Suggested Reading” or “Popular Articles”. 7. Easily build special issues with your existing content. Create or curate themed issues – early editions or topical collations. Our IssueM plugin and Migration tool lets you quickly move selected posts into issues. Leaky Paywall also allows you to customize the meter for your issues. You can leave them open as a content sampler or restrict them to subscribers. Take a look at “The Weekender” which goes live every Friday – Sunday to help readers catch up on the week’s news. 8. Flex your meter to take advantage of traffic fluctuations. You get to decide how much your paywall leaks. Many of our customers like to experiment with their results: restricting access during high traffic seasons to encourage fast subscriptions and loosening it to entice more readers during slow times. See how Military Living did it. 9. Restrict premium content to higher-level subscriptions. You set what gets metered and how. If you have a huge backlog of older material, a treasury of long-form content, or a library of video and audio, you can meter them separately from your standard articles. Create an archive of premium content and allow only premium subscribers free access. 10. Meter your iOS and Android app content, too. You can easily select how to meter your content with Category Restrictions. Rather than choosing article by article or issue by issue, you can decide what access you want to allow by your pre-existing WordPress categories. Give readers free access to your classifieds or obituaries, while still running the meter on Business News or Premium content. Specific control made simpler. 11. Share content aggressively through all social streams. It is absolutely true that people trust word-of-mouth above any other marketing stream. It is also true that social media is today’s word-of-mouth. Leaky Paywall allows readers to share content thousands of times across all social media platforms, no matter how short the original meter. If they can read it, they can share it again and again and again. 12. Promote specific issues in Facebook. We’ve seen customers use this social media flexibility in a number of creative ways. Modern Drummer uses their Facebook as a mini-issue every time they publish a new one. Thanks to Leaky Paywall, they can safely link to all of their featured articles. The meter starts running when readers choose an article and head over to the Modern Drummer site to read it. 13. Start building your email list. List-building is foundational to modern marketing efforts. If you are running the Leaky Paywall meter simply start collecting email addresses and sending them excerpts of your content each day, week, or month. This will send readers back to your site which will use up their meter allotment and prompt them to subscribe. It’s a great organic way to motivate paid subscriptions. MailChimp offers a a free pop-up function (or grab more fancy ones through Icegram or PopUp Maker) to encourage visitors to join to your email list (or lists) for free. This starts them down the sales funnel to becoming paid subscribers. 14. Section your readers in MailChimp. If you send different types of emails, Leaky Paywall and MailChimp can automate which email list your readers are added to, based on their subscription level – whether they’re premium members, regular readers, or just browsers. 15. Automatically remind forgetful readers that you’re still around. Leaky Paywall and MailChimp work together to send a little nudge to readers who haven’t logged-in for a while. This requires a little customization but you can hop into MailChimp and pull readers who haven’t logged-in in X number of days. MailChimp will send a reminder email that they’re missing out. 16. 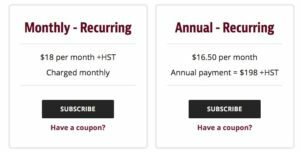 Customize and strengthen your subscription page. There is default intro text on the page that prompts browsers to subscribe, but you have the option to customize it into a real sales tool. Spell out the benefits of your subscription right from the get-go. 17. Style your subscription option cards. As with the page itself, the placards displaying the subscription options come with default styling. But you have the option to dress them up, to enumerate on the benefits, or just to fit your brand. CSS will do the trick. (Card styler plugin coming soon). 18. Add sales copy to the subscription nag. A default message pops up when the meter runs out, prompting the reader to sign in or subscribe. Give your sales message a boost: make that copy your own. 19. Customize fields for logged-in subscribers on page. Some nifty effects can be achieved without upending your chosen layout or style. For example, swap out the ‘log-in’ button for an ‘account info’ button. This leaves the user experience consistent and doesn’t add extra or unnecessary fields to restricted pages. Requires some customization. 20. Create a fading text effect on restricted pages. When the meter runs out, you can immediately present the reader with the subscription page. Or you could let them see the first few sentences of the article they’re reading and have it fade out down the page as they reach the subscription nag. It’s an additional tease of the content. Plus, it just looks really cool (requires some CSS). Believe it or not, these are just the highlights of all the amazing things that Leaky Paywall can already do, without any fancy customizations or modifications. And that’s not counting the most amazing thing of all: helping you exponentially increase your paid subscriptions. Ready to give it a try? Let’s talk about what Leaky Paywall can do for you.